Vend Ecommerce. What is it and how does it work? – How can we help? Vend Ecommerce. What is it and how does it work? 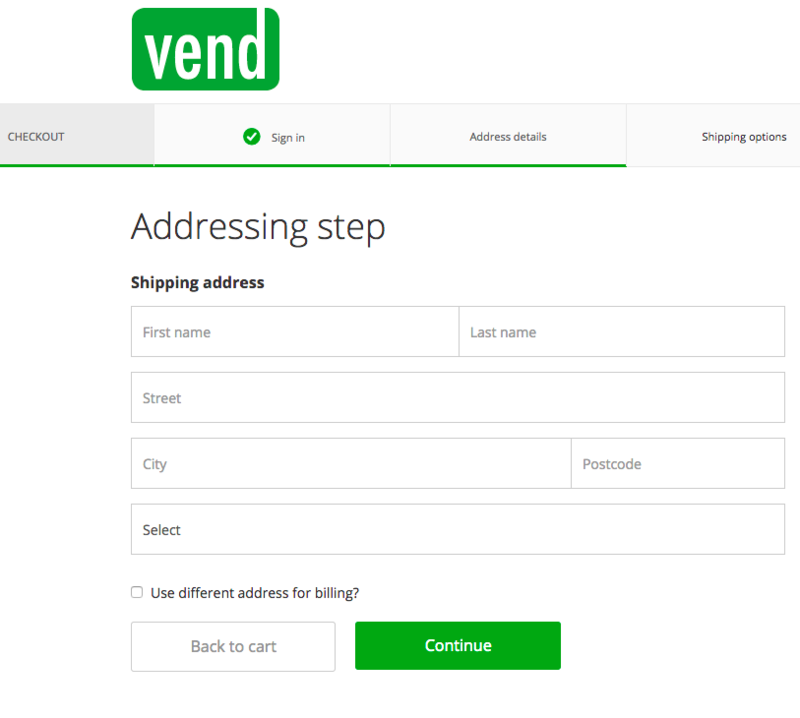 How does Vend Ecommerce work? How do I buy a new theme from the marketplace? How do I create my navigation? Important: Vend Ecommerce is available on the Advanced and Multi-Outlet (or the latest Pro and Enterprise) plans. If you’re on the Starter or Lite plan you will need to upgrade plans in order to use Vend Ecommerce. When you enable Vend Ecommerce, you will get an online store that is like an extra store window into your business, where customers can shop from anywhere at any time. Your new store will be linked with one of your outlets in Vend, and the inventory from that outlet will be live-synced with your online store, helping you to get the most out of your inventory. If you make a sale in-store, the inventory available online will automatically be updated, and the same applies to sales made online. When you create your store, all your existing Vend products will be added to your online store, and you can easily toggle them on and off from being sold online. New products added in your Vend store will also automatically appear in your Ecommerce admin, ready for you to categorise for sale. Product information is managed in one place, with data and images managed in Vend, and seamlessly synced to your Ecommerce store. Vend's reporting will enable you to report on all your sales in one place - you'll be a true multi-channel retailer. No syncing of composite products. You cannot sell composite products in your store. Your online store will be linked to a single outlet in Vend, and show that outlet's inventory. You are not able to change outlets once you have picked which one to use, but you can change which register Ecommerce sales appear in. To do this, click the link here. For a step by step guide on how to set up your Vend Ecommerce store follow the instructions below. Click Ecommerce in the menu bar. A new tab will open so you can start to create your store. 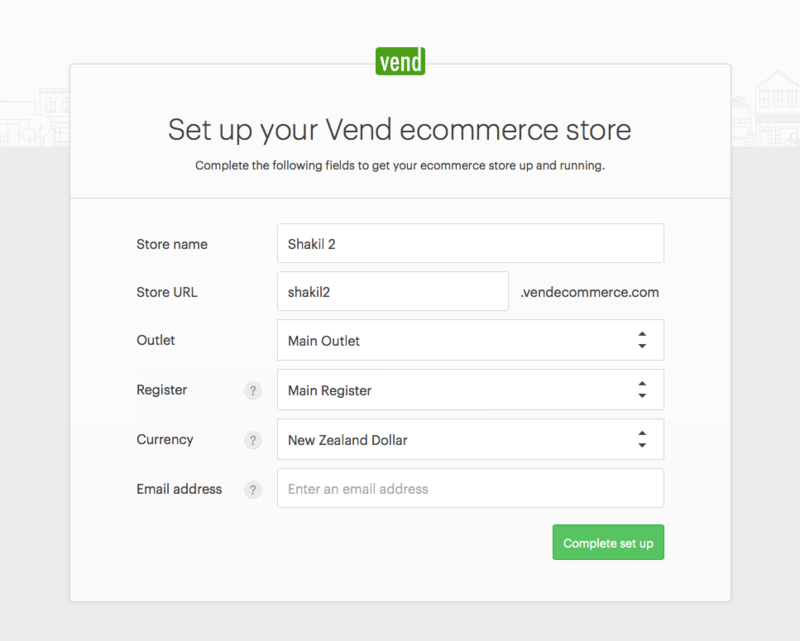 We will automatically create your store name and URL based on your Vend store details. Select an outlet and register. Your Ecommerce store will share the inventory of this outlet and display it online. Note: You cannot change your outlet after this step so make sure to choose carefully! If you'd like to change the register after this step, click here to find out how. Confirm the currency your prices will be displayed in. You can update this later. Enter the email address you'd like us to send order notifications to. You can update this later. 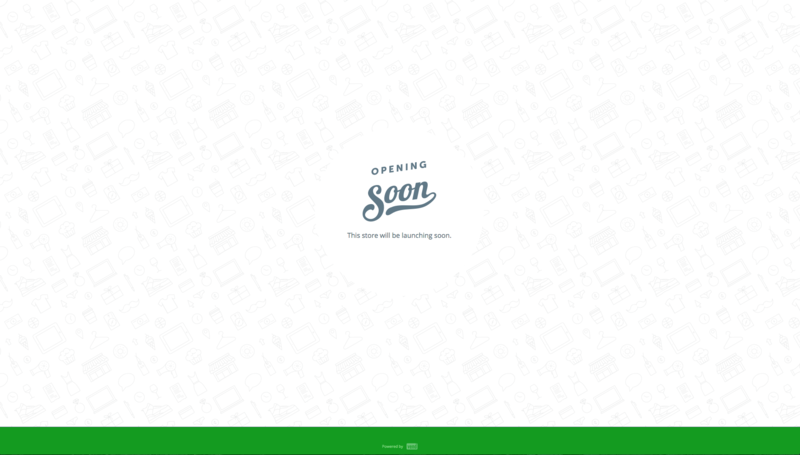 Once your store has been created, you'll be asked to log in to your Vend Ecommerce store. Once logged in, you'll see the Dashboard. It will take us a while to sync all your products over, so don't be alarmed if you don't see them all immediately. As outlined above, your structure is how the information in your ecommerce store is organised, including organising products into collections, creating pages, and making navigation. Collections are used to categorise your products. They're a great way to help your customers browse your store and find the perfect product to purchase. You can create as many collections as you like. You can also have sub-collections, for example, a collection called 'Women's Clothes' with sub-collections for 'Dresses' and 'Tops'. Items can be in more than one collection - this can help increase the discoverability of a product. By default, you'll have one collection already created called 'Frontpage'. This is the collection that most themes use to display products on the front page of your store. Make sure you don't change the name of this collection. In the menu bar, click Collections. Click the Add Collection button. A new page will open. Describe the collection. If you're using the default collection, this won't be displayed. In the future, with custom templates, you could choose to show this. At this point, you may also want to embed an image into your collection description. To do this, click on the image icon in the Description bar and search for the picture you'd like to add. Next, select a parent collection (if any). You only need to do this if you want this collection to be part of another collection (like 'tops' being part of 'women's clothes' for example). A notification will appear at the top of the screen prompting you to add products to your new collection. You can do this now, or wait until you've set up your store layout. When you don't want to use a collection anymore, you can delete it. This does not delete any of the products in the collection - instead, it just removes the collection grouping. Important: If the collection is linked in your navigation, you'll need to remove this, as it will not be automatically updated. Click the name, and select Delete. Once you've created your pages and collections, you're ready to set up the Navigation for your store. 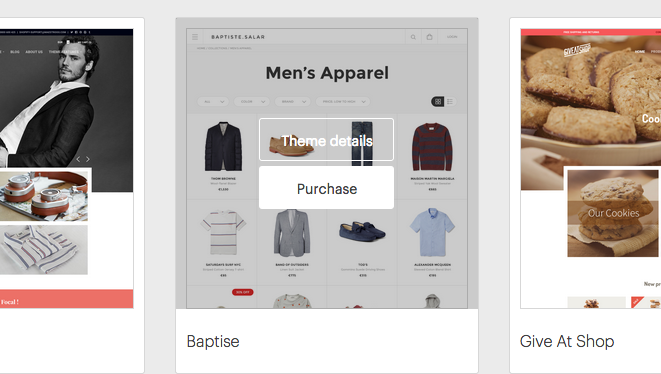 You might want a refresher of how your store theme looks before setting up the Navigation - you can go back to the Themes marketplace and preview your chosen theme again to see how a finished site's Navigation might look. The Navigation is essentially a collection of links. These could be Pages, Collections, external links, or another Navigation. Main Menu. This is the primary menu navigation for your store and is created by default. Depending on your theme, it might be at the top or the side of your page. Sub-menus. You can create multiple sub-menus. Sub-menus are used to create a drop-down within your main menu. For example, your main menu might have the option 'Women'. This would link to a sub-menu 'Women' which had your collections linked to it. Before you start setting up your menus, it's a good idea to draw or plan out your menu structure. This can save you loads of time as you'll be able to get a great idea of how you want your Navigation to look before creating it in Vend Ecommerce. The plan below was done on a computer but even just sketching one out on a piece of paper can be a big help. the list handle (slug) of a sub-menu, if you're linking it in the main menu. In your Ecommerce store, under Design, choose Navigation. Creating a sub-menu, click Add Navigation List. Editing an existing menu list (like the main menu), click the list name. Name your Navigation list. A 'slug' (a handle for your list) will automatically be created. Name the link. 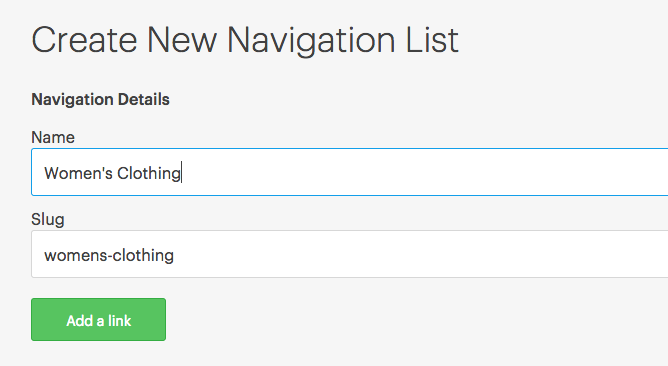 This is what will appear on the Navigation menu in your Ecommerce store. Frontpage. The homepage/landing page of your store. Web Address. An external web address OR the list-handle (slug) of one of your sub-menus. Collection. One of your collections. Page. One of your pages. Web Address. For a sub-menu, just type the list-handle (slug) name exactly. For an external URL, you'll need to include the http:// at the start, for example http://google.com. Collection/Page. 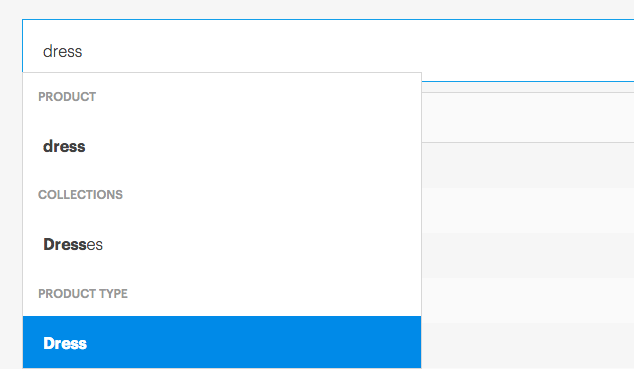 Select the collection/page you want to link to from the drop-down. Click Add a link to add another link (you might have to scroll up). Once you're done, click Save (at the bottom of the page). Repeat the above steps to create each sub-menu, and then finally edit the main menu to create this. Set your logo. This needs to be an image URL (uploads are coming soon), but you can use the URL of the logo you set up as part of your theme. Just navigate to yourstorename.vendecommerce.com and right-click the logo image. Choose Copy Image URL and paste that URL into here. Background colour. This is the colour of the main part of your checkout page. Navigation colour. This is the colour of the bar at the top of the page. Button colour. The colour of the buttons used to move to the next step. It's super important to get your taxes set up correctly, so you charge the correct amount to your customers, and don't get in trouble with your local tax authority! Before you begin, there are some important things you need to know. Vend Ecommerce does not support: - European Union digital products ('VATMOSS') - Tax overrides (such as no tax on fresh fruit and vegetables, or luxury goods taxes) - Compound taxes - Complex US state taxes, including destination-based taxes. Vend Ecommerce can only specify one tax per province/state, and more complex taxes are not supported. Before setting up any taxes, we strongly recommend speaking to an accountant who specialises in retail sales taxation. How do taxes in Ecommerce work? Within your country, you might need to charge the same tax rate to everyone, or a different tax rate to people who live in different provinces/states - it's really important to talk to an accountant about this. Some countries have very complex retail tax requirements for selling online (like the USA). When you set up your Ecommerce taxes, you'll be linking to tax rates you've created in your Vend store. Any single tax rate can be linked to - you won't be able to link to a tax group. This means you'll need to have already created all the tax rates in your Vend account. Some retailers (like those in Australia and New Zealand), will probably be ready to go, but if you're in a country with more complicated regional tax requirements like Canada, you'll need to spend some time setting up all the tax rates you'll require in your Vend store. If you have several provincial/state taxes with the same name/rate but that need to be paid to different tax authorities, we strongly recommend you set up a separate tax for each authority - for example HST - PEI and HST - Quebec. This is due to how taxes are reported in Vend. We're only able to report on the total tax amount for each tax type in a time period, not the shipping location of the customer. This means that to get accurate tax payment amounts for each tax authority, you'll need to set each tax rate up separately. If you have state AND county tax, you'll need to set up a single tax in Vend for these. You cannot use a group tax, as these are not synced to your Ecommerce store. For example, if you have a California sales tax of 5% AND a Los Angeles sales tax of 2%, you would need to create one tax rate in Vend for them both - an LA-California tax of 7%. In the Vend Ecommerce app: - Under Settings, select Taxes. Select whether you'd like to display prices including tax. Use the Select Country drop-down to choose your country. Select your country tax rate from the drop-down. This is the tax rate that applies universally across your country at a federal level (for example VAT and GST). If you have no federal tax, select No Tax. If you have no provincial or state taxes, you're now done - we've automatically saved your tax. If you have provincial or state taxes, click Add provincial tax rate. Choose the tax rate for that province. Choose whether the tax rate is added to the country tax or replaces the country tax. You'd use Add if you have a country and province tax, and replace if you only have a province tax and don't want the country tax to be charged. If you've got more provincial taxes to add, click Add provincial tax rate. Help! I can't find the tax rate I need in the drop-down! Tax rates are set up in your main Vend store. Make sure you've set up the tax rate there, then refresh your Ecommerce store. I need a tax rate for the county my store is in. At the moment, Vend Ecommerce doesn't support county-level taxation. You can try creating a single tax rate in Vend that combines the state and county-level taxes, but make sure you check with your accountant first about how this will impact your tax reporting. I don't know what tax rates to set. Check with your accountant or local business services. They're the best people to help you understand your local requirements. I don't want to charge tax to out-of-state/International customers. International customers will never be charged tax. Out-of-state customers will only be charged tax if you've got a country-level taxation rate set, or you've set up a tax rate specific to the state/province that customer lives in. To take payments online, you'll need to set a payment service. This is called a 'gateway'. Shipping methods are used to specify the cost to ship to different regions of the world. In your store's General settings you can change your store status, update your store name and currency, edit your SEO settings and link your Google Analytics account. To find the General settings navigate to the sidebar and click Settings -> General. 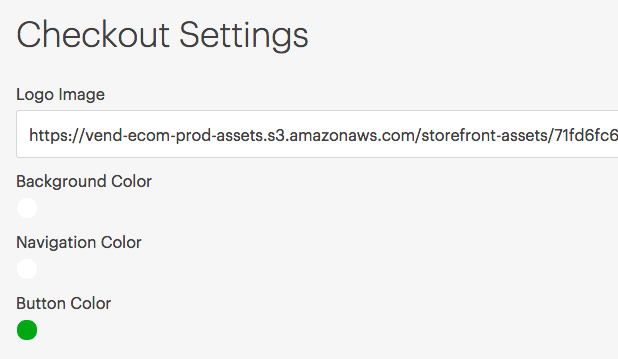 If you wish to hide your store temporarily or disable it, you can toggle its online status from the General Settings page. If you choose to switch your site to offline mode, you will be able to include a customised message for your customers that will display when they attempt to access your online store. Note: Note: This will only prevent customers from viewing your store and will not affect your ability to view your store and update its settings while logged into Ecommerce administration. If you wish to view the offline message or test the offline mode, you will need to be logged out of Ecommerce when you visit your online store. When you first setup Vend Ecommerce, you can specify which of your Vend store's registers you'd like to post Ecommerce orders to. If you'd like to change this register, head Settings -> General in the sidebar and scroll down to the Associated Register section. Once here, select your desired register from the dropdown list and click Save Changes. You can change your store name and store email under the Account section in General Settings. Changing the store name here will change the name that will be included in emails sent to your customers. If you want to change which email address your ecommerce store uses to email your customers, you can make the change here as well. An email will also be sent to the email address you've specified here when orders are placed on your ecommerce store. You can change your store's currency under the localisation section in General Settings. This will change the currency prices are displayed in. Filling out the Home Page Title and Meta Description fields under Search Engine Optimisation Will help define how your store appears on search engines such as Google. Home Page Title: This will be the name that displays on search results for your store. Meta Description: This will be the description of your site that appears in search results for your store. An example of how this will appear in search engines can be found under Search Engine Optimisation in the General Settings page. Meta Keywords: Meta keywords help how your site is ranked in search results. If, for example, you ran a clothing store the keywords you'd likely use would be words such as "clothing", "brand labels" and "fashion". Google Analytics enables you to track the visitors to your store and generates reports that will help you with your marketing. 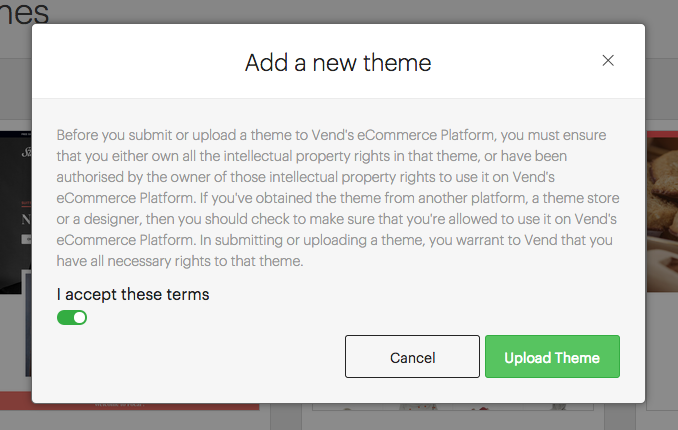 If you already use Google Analytics, you can insert your Google Analytics ID into Vend Ecommerce by navigating to Settings -> General. To retrieve your Google Analytics ID, you will need to sign in to your Google Analytics account and copy the code that looks like this: UA-1111111-1. If you have not set up Google Analytics or are after more information about how it works check out this link here. When you initially create your store, we'll sync all your active products in Vend to your Ecommerce store. This includes any photos. Find the product in the list using the search. This searches name, collection, tag, type, and supplier. Tick the box(es) next to the product(s). Click the white drop-down box at the top of the list. Choose the collections you would like the product added to. > Hint: If you're adding a product to a sub-collection, we also recommend adding it to the parent collection. This makes it easier for your customers to navigate. Important: If you've got more than 50 products that match your filter, you'll need to scroll down to ensure they are all showing before you use the Select All box. Otherwise, only the first (visible) 50 will be added. If you see lots of notifications, refresh the page, and these will go away. Don't worry; your customers won't see these. You can test adding a product to your cart and going through the checkout process. 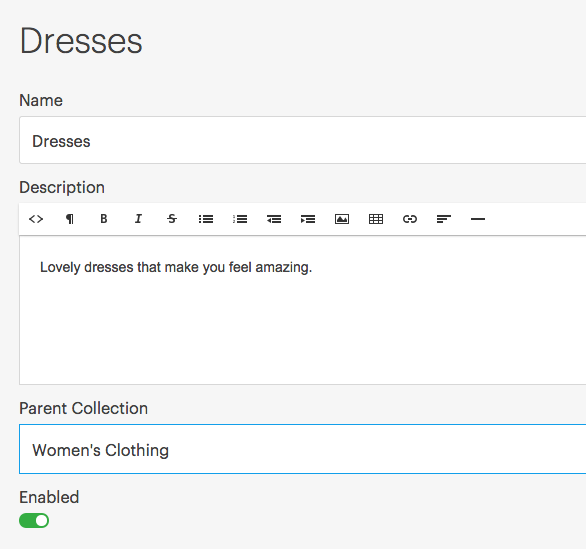 Log into your Vend Ecommerce store admin panel. Go to the orders page. You'll see a list of orders. New orders will have a status of 'Confirmed'. Click on the order number. You'll see the details of the order. Collect the items for the order. When you're ready to ship, click the Ship button. Enter a tracking number for the shipment and any other shipping information (optional). Your order status will be updated to Shipped. The customer will now receive an email notifying them you have shipped their order. Send the item to your customer.